Greetings, Dragon Lords! 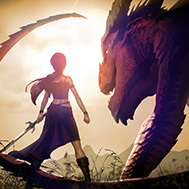 v4.37 of War Dragons is a minor update with some high-priority bug fixes and improvements. Not our biggest update, but one that heralds our upcoming major update next month! There are no Castle Guards on the Castle. The team that holds the castle has less than 10,000 Troops present. The Primarch trying to conquer the castle must have more Troops than the total enemy Troops present. [Atlas] Updated warning messages to be more descriptive when flying Primarchs around in Atlas. Fixed an exploit where players on multiple devices could simultaneously defend. [Atlas] Fixed an issue where Dragon Rider Glory was being double-counted and displaying inflated Rider Glory amounts which could cause sync errors when trying to level up Riders. Fixed a number of bugs with the Armory. [Atlas] Updated the Glory scaling amount in the Attack Radial menu to correctly reflect the current Glory scaling mechanic that takes the average of the level component and the team Influence component. [Atlas] Added missing Arabic translations for Atlas Quests and Missions. [Android] Fixed some common crashes.